Voice Factory is the City of Birmingham Choir’s education programme. Encouraging and promoting choral singing, it gives opportunities for both adult and young singers to develop their skills. In this programme, which has seen a variety of successful ventures including workshops, subsidised tuition and performances in Symphony Hall and Town Hall, the Choir seeks to encourage music making with young people and to help provide singers for the choirs of the future. Voice Factory VII trained young singers to participate in our Zimbe! – Come sing the songs of Africa! concert in June 2015. We worked with several partners to deliver this wonderful concert project, which was generously supported by Phoenix Group. A series of day workshops led by City Choir members and professional vocal coaches inspired young people from primary schools in the region to enjoy singing, to have some further singing lessons, and to take part in concerts with the City of Birmingham Choir. We provided performance opportunities for local school children via Birmingham Music Service, which formed and trained a special Birmingham Music Service Chorale, which performed as part of our Carmina Burana concert in May 2011, and at Christmas Treats in December 2012. We worked with Bournville Young Singers, an independent choir covering an age range of 5 to 18+. The BYS were involved in the hugely successful Equinox project, which took place in March 2012. In May 2017, we performed Walton’s Belshazzar’s Feast in a second superb collaboration with the Birmingham Schools’ Symphony Orchestra with Michael Seal conducting. In May 2011, we performed Carmina Burana in an acclaimed collaboration with the BSSO with Michael Seal conducting. 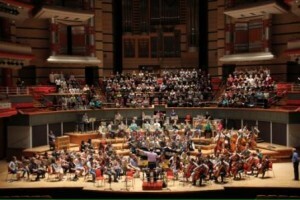 In October 2010, we performed Verdi’s Requiem with the English Schools’ Orchestra in Symphony Hall. These events provide great opportunities for school students to perform in Symphony Hall with a full-sized chorus and are also a rewarding experience for the choir to work with talented young musicians. In Phase II, we are holding a series of all day workshops for the choir, approximately twice a year, where some excellent vocal and choral development work takes place and a good social time is had by all. 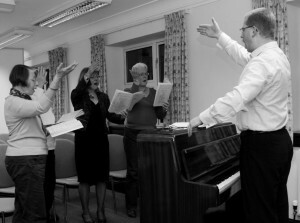 In Phase I, all Choir members took time out from rehearsals for professional coaching sessions in small groups. This aimed at raising individual singing standards and improving the Choir’s ensemble performance. We aim to encourage greater access to the Choir by providing new applicants with the means to improve their vocal skills as they join. The scheme offers financial support towards the cost of singing lessons for a limited number of new members in each year. Also all Choir members in the age range 16 – 25 are offered a series of free singing lessons. As a means of benefiting some of the many Choir members, and others, who have interests in wider choral activities, we have run Choral Conducting workshops led by our own conductor, Adrian Lucas. You can see that we have been enterprising and innovative over a number of years. This has involved much hard work from our dedicated members, who are all volunteers, and the support of many funders – to whom we are very grateful. To pay for these schemes and to continue them in the future, we have to raise the funds needed. We are grateful to the various charitable trusts, corporate partners and individual donors for providing support for the Voice Factory programme. If you think you could help us with this important work – or you know of someone else who might – please contact us, selecting “Supporting the Choir”.